Le plus petit maillot de bain du monde | One quality, the finest. On July 5, 1946, the world got its first eyeful of a beautiful woman in a skimpy bathing suit known as a bikini. Inventor French engineer Louis Réard named the modern bikini it after Bikini Atoll in the Pacific, the site of nuclear weapon tests a few days earlier. 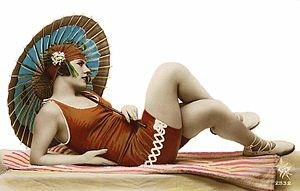 Although two-piece suits had been on the scene for several years, they covered a lot more skin than Réard’s model, advertised as “le plus petit maillot de bain du monde” (luh ploo puhtee myowe duh bahn due mond) “the smallest swimsuit in the world,” so small that it could actually fit in a match box held in the model’s hand. Another French designer, Jacques Heim, had introduce a two-piece in 1932, but the bottoms were more like shorts and the top was more like a T-shirt – not the itsy-bitsy suit of Réard. Réard, a car engineer, turned to designing swimwear when he started working at his mother’s Parisian lingerie shop. He understood the need to make a big splash with the teeny scraps of fabric and planned to launch this fashion bombshell at Paris’ Piscine Molitor, a public pool. The problem was finding a model who would be willing to reveal so much skin. The solution was to find someone who habitually revealed even more. Micheline Bernardini, a dancer who regularly took it all off at the Casino de Paris nightclub wore the newspaper patterned suit. The nuclear fision Réard was looking for happened. The look and the name have been an integral part of summer ever since. This entry was posted in Fashion and tagged Bikini, Jacques Heim, le plus petit maillot de bain du monde, Louis Réard, Micheline Bernardini, Piscine Molitor, Swimsuit. Bookmark the permalink. That’s very witty! And it takes another engineer to notice!